Considered by many to be among the best vaporizers ever made, the 7th Floor Da Buddha Vaporizer offers numerous features and benefits that separate it from other personal models on the market today. With this innovative desktop vaporizer, you can enjoy your favorite aromatic herbal blends or even vape dry herb. Handcrafted in the USA, the Da Buddha is remarkably low in price considering its many features, innovative design, efficiency and quality vapor production. The Da Buddha by 7th Floor has a unique shape that looks stylish in both the black and silver finishes that are available; however, the cylindrical heating chamber isn't just crafted with style in mind. The shape of the heating chamber helps to increase air resistance as you draw from the vaporizer. As a result, the vapor is naturally cooled, making it far more pleasing to inhale. The extra wide herbal chamber also separates the Da Buddha from other dry herb vaporizers and allows for optimal air flow to enhance vapor production and ensure that each herbal sample is fully vaporized with every use. Read a Da Buddha Vaporizer review or two, and you'll quickly see that the 7th Floor brand has an impressive reputation for producing flavorful, robust vapor throughout use. This is because the Buddha features only the finest of materials. The heating element is all ceramic, allowing it to reach its optimal temperature rapidly and stay at the ideal temperature no matter how frequently you draw. All of the interior components are made out of glass rather than metal or plastic. This keeps impurities out of the vapor to ensure that its flavor is rich and pleasing. It is a convection model, meaning that warm air is used to heat the herbs or dry herb. 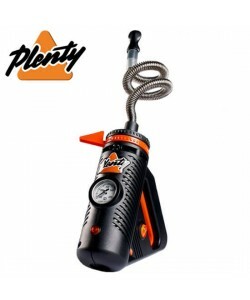 This ensures that vaporization occurs continuously and completely and largely eliminates the risk of combustion. The 7th Floor Da Buddha Vaporizer is a whip style, meaning that you draw through a special device called a vaporizer whip. The whip included with the Da Buddha is crafted to enhance the convenience of the entire unit and set it apart from other whip style models on the market. For example, the whip is engineered to make it as easy to remove the screens as possible, eliminating the hassles that come with other whips. Like all vape whips, the Da Buddha whip consists of three parts, but each part is manufactured with care and attention to every detail. First, there is the glass wand, which holds your dry herbs and is inserted into the space on the Da Buddha heating cover. The whip vaporizer features a special ground glass connection, which allows you to insert the vapor wand and then let it go. The hands-free operation ensures your comfort while you vape and reduces the likelihood of accidental burns. The whip included with the Da Buddha Vaporizer also features a glass mouthpiece. As with the internal components, the use of glass for the wand and mouthpiece keeps chemical contaminants out of the vapor to ensure that it tastes graces. Completing the design of the Da Buddha vape whip is 3 feet of premium silicone tubing. The extra long tubing allows you to sit comfortably away from the desktop vaporizer while you draw. With the Da Buddha, you can easily adjust the temperature of the heating chamber to the ideal levels for the specific type of herb that you wish to vape. The herbal vaporizer includes an internal temperature control system with a range of 150 degrees Fahrenheit to roughly 650 degrees Fahrenheit. The temperature adjusts easily with the manual knob featured on the front of the whip. Depending on the temperature setting, the 7th Floor Da Buddha will be ready for use in roughly 2 to 4 minutes. At 6.44 inches by 5.44 inches by 5.44 inches in size and just 1.55 pounds in weight, the Da Buddha Vaporizer or DBV is more compact and much lighter than many other desktops. The model requires electrical power for operation and comes in three versions for use around the world. You can choose from a 110-volt model for the U.S. and Canada, a 220-volt model designed for use in Europe or a 220-volt model made for Australian outlets. Along with the whip and the DBV, 7th Floor provides a stir stick with the vaporizer for dry herbs. The stick can be used to mix up your herbal blend and ensure even vaporization. Also included is a padded bag that protects the vaporizer from damage when you're storing it at home or traveling with it. The Da Buddha Vaporizer comes with a 3-year warranty from Seventh Floor. To ensure best results, the stainless steel screens in the vape whip and the vape tube should be replaced every 2 to 3 months. You can purchase extra screens and vape tube for the Da Buddha vape here at VaporPlants.com. We also carry additional parts and accessories for the DBV. from the purchasing experience to the use of DBV... excellent product from excellent supplier... couldn't be happier with both... Vapor Plants delivered as advertised... and based on my research of this product, it has performed as expected... love the simplicity... it is solid thou, and fine... and will get you mighty high in no time... yep, enjoy! Absolutely wonderful - Review by Alberta G.
The Da Buddha Vaporizer is absolutely wonderful. It is made beautifully out of what feels like really high quality materials. It looks great and comes with everything that I needed including a seriously nice carrying bag. It is simple, functional and beautiful. I have tried so many other vaporizers and this is everything I wanted from one and more. Never had an issue - Review by Fred M.
My Da Buddha Vaporizer works incredibly well. This is definitely the best vaporizer for the price. The hits are really smooth and you can really taste every bit of material. It has cut my spendings on my material in half because so little of it goes such a long way. I only need .1 grams at a time. The glass does not break easily in my opinion. I have had it for more than a year now and have never had an issue with it. In love with it - Review by Daryl J.
I bought the Da Buddha Vaporizer recently and am in love with it. I am a new vaper so I wasn't sure what to expect but I got exactly what I paid for I think. Really good vape - Review by Craig K.
This is the second vaporizer that I have ever owned. It has worked well for me for over two years. It takes a little bit of time to get used to and get figured out but overall it is a really good vape. Needs a digital display - Review by James P.
The only thing is I wish it had a digital display instead of a dial. Heats up super fast - Review by Lillian A.
I have had my Buddha for a long time and I have never had a problem with it. It heats up super fast and gets the job done right. 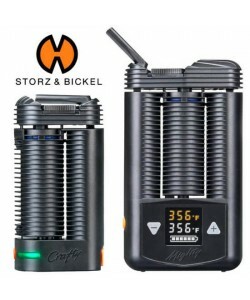 Best vaporizer - Review by Angela A. The Da Buddha is so easy to use and the results are incredible. I was told a long time ago to switch to this vape and I wish that I had listened a long time ago. This vape is the best thing I have ever bought. This unit is way too simple to use and it is even simpler to clean. The price is well worth what I am getting out of it. Solid vape - Review by Vivienne K.
The Da Buddha Vaporizer is really easy to clean and maintain as well. All around a solid vape that I would recommend to anyone. Easy to learn - Review by Donald D.
I love the Da Buddha but I have noticed that if I use it on a really high setting then my material tastes burnt. Other than that, it is an incredible product. I get massive rips from it on lower temperatures. I thought this vaporizer was really easy to learn how to use and it has a really simple design. Super easy to maintain - Review by Trevor B.
I love my Da Buddha Vaporizer because it is so easy to use and has virtually no learning curve, at least not in my experience. I was skeptical when buying it at first but I am so glad I did. I think it is a must have for anyone from beginners to advanced users. It heats up quickly and does not ever burn my material. Plus it is super easy to maintain and keep clean. This unit very well built and it’s quite smart but the design makes it look hospital like, 7th Floor Vapes might want to redesign it and make it look more modern, like the Volcano. Otherwise, super high temperatures which means you have a lot more control over it and great vapors.